Weerawansa to end fast today? 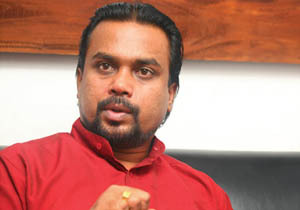 Jathika Nidahas Peramuna (JNP or National Freedom Front) leader and Engineering Services & Housing, Construction Minister Wimal Weerawansa may end his fast unto death today (July 10), say sources. With UN chief Ban Ki Moon calling again on the Sri Lankan government to ‘normalise the situation’ for the organization to carry on its vital work, sources say that the government may persuade Mr. Weerawansa to end his fast unto death. They claim that the protest may only increase the UN Secretary General’s will to go ahead with the work of the already appointed three member panel. While President Mahinda Rajapaksa has successfully mediated in the Maldivespolitical issue and brought about a solution, sources close to the government said that the protest against the UN chief would dilute the President’s role in the Maldivian affair. It would be better to convince other countries to stand by Sri Lankawithout antagonizing them, these sources have pointed out.